On July 25, the Northern Virginia Affordable Housing Alliance and the Coalition for Smarter Growth co-hosted a community forum on the preservation of market-affordable housing along the Richmond Highway corridor. We organized the forum to highlight the findings in our recently released report Northern Virginia’s Preservation Challenge, and to call attention to the risk of losing hundreds of privately-owned, market-affordable apartments as an unintended consequence of Fairfax County’s recent adoption of the EMBARK Richmond Highway corridor plan. With close to 100 people in attendance, it was clear that this issue is of growing concern to the community. EMBARK is an exciting plan that will bring bus rapid transit, mixed-use development, improved bike and pedestrian access, new parks and plazas, and opportunities that attract new businesses and residents. The plan creates a vision for an area of the County that has long suffered from under-investment. However, without robust strategies to preserve the housing that is affordable, hundreds of low income households could be displaced due to rising rents or redevelopment of their properties. During the multi-year planning process, housing advocates urged that preservation policies be incorporated into the overall EMBARK plan, as these strategies are more effective as part of a comprehensive land use plan rather than added on after plan adoption. However, immediately after the plan was approved in May, Supervisors Dan Storck and Jeff McKay did create an EMBARK Housing Advisory Group to address affordable housing preservation strategies. This group, which has begun to meet, has considerable challenges before them. Many owners along the corridor are reluctant to sell properties that are fully occupied and produce a healthy cash flow. Those who might sell are expecting higher prices based on the fact that the new land use plan, with transit improvements and mixed-use, higher density development, will bring new investment to the area. As a result, these valuations make it difficult for affordable housing developers to purchase older apartment complexes and convert them to committed affordable units. Higher purchase prices simply do not allow these affordable housing deals to work out financially. Throughout Northern Virginia, we have lost tens of thousands of units of housing that would be affordable to a family of four earning approximately 60% or less of area median income ($66,000/annually). Given these losses, our goal for Richmond Highway should be no net loss of affordable housing. As the advisory group and county staff build their recommendations, there are a wide range of preservation tools and strategies that should be considered. As a first step, the County has agreed to develop an inventory of both committed affordable housing and older properties with market-affordable rents in the corridor. Priority should be given to properties located within or adjacent to the six Community Business Centers (CBC) that are at risk of conversion to higher rents and/or have the greatest potential for redevelopment. This inventory will provide a baseline for how many market-affordable units exist along the corridor, and help to achieve the goal of ‘no net loss’ as we track what can be preserved, or the percentage of affordable units to be included in a redeveloped site. An inventory of publicly-owned land should also be developed. Co-locating affordable housing with public facilities – fire stations, libraries, and community centers that will serve the new residents and workforce there – offers another opportunity to acquire land at little or no cost. There are numerous examples of co-location across Northern Virginia, including the County’s own Residences at the Government Center. The County could also foster partnerships between affordable housing developers and supportive houses of worship that have land to create housing, as some faith communities in Arlington and Alexandria have done. Planning and zoning tools such as density increases, reduced parking ratios, or green-taping of approvals in return for preserving existing affordable units should be examined. Working with private owners, the County could consider incentives such as tax abatement for well-maintained properties that keep rents at affordable levels, or low-cost loans for improvements in return for committed affordable units. In either an acquisition or redevelopment scenario, the cornerstone of an effective preservation plan is public sector investment, and so Fairfax County must provide gap financing to developers of affordable housing. To do this, the County will need a substantially larger housing trust fund and should consider a bond for affordable housing development. 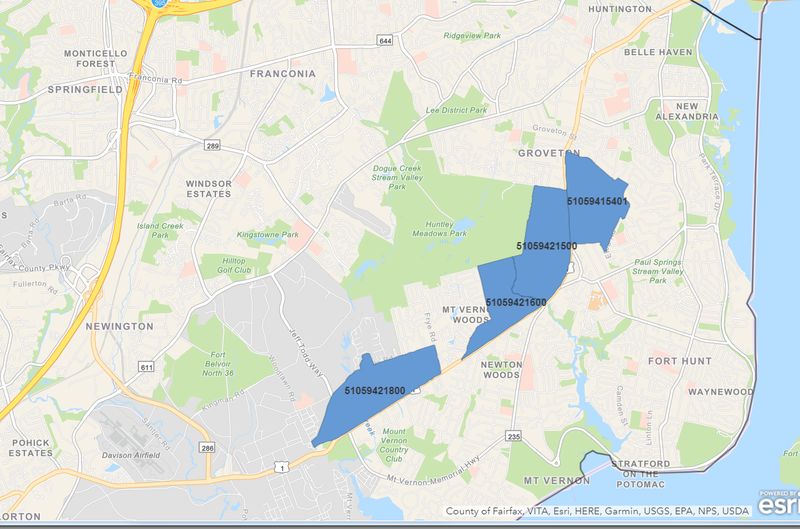 Since four census tracts along the Richmond Highway corridor have been selected as Opportunity Zones, public sector dollars will also be needed to leverage any potential new investments related to these designations. Maintaining and expanding affordability along the EMBARK corridor allows low-income households who live there – overwhelming people of color – to participate in the new neighborhoods of opportunity that will be created there. This is at the intent of the One Fairfax Pledge adopted by the Board of Supervisors in July 2016, directing that “a racial and social equity lens be applied in the planning and delivery of all public services.” Recognizing that “people of color are driving Fairfax County’s population growth, and their ability to participate and thrive is central to the county’s success,” recommendations for the corridor must be viewed through a lens of social and racial equity. This is the County’s promise of One Fairfax. Recently, EMBARK Richmond Highway won the 2018 Commonwealth Plan of the Year Award from the American Planning Association’s Virginia Chapter. 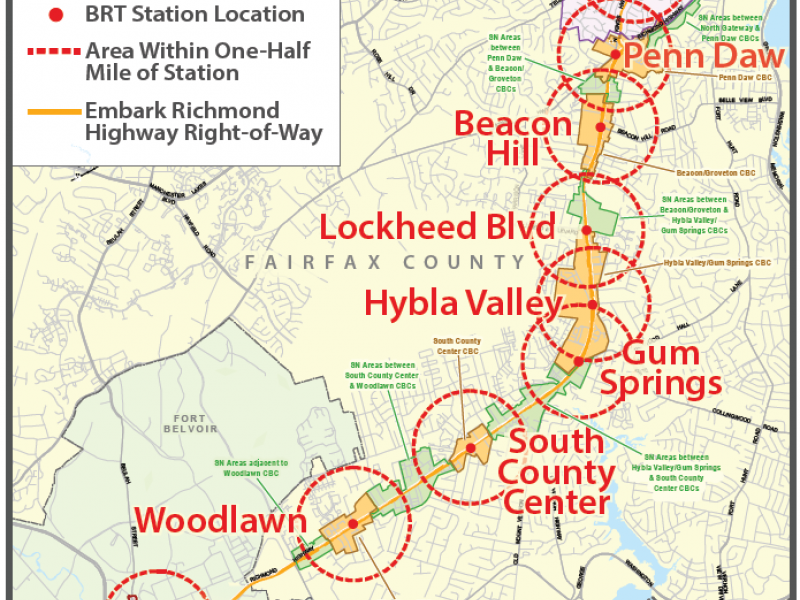 It will take several years to realize the vision for this innovative plan, so now is the time for Fairfax County to adopt policies to ensure that the EMBARK corridor becomes a thriving, diverse and sustainable community for all who live there.